The Atlanta range of training wear offers a sleek and modern design that will suit any club. The Atlanta Fitted Polo offers a slim fitted version of a classic style. It is the perfect and smart addition to your training wear. They look fantastic and are made to last. 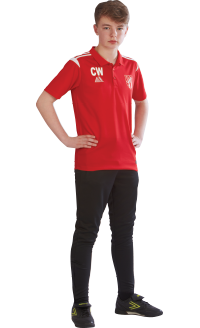 With their moisture wicking fabric, the Fitted Polo is comfortable to wear during training but will looks smart enough to represent your club. The Atlanta Polo has a choice of 8 different colour combinations. You can decide between Black/White, Navy/White, Black/Red, Red/White, Royal/White, Black/Yellow, Royal/Yellow, and Navy/Yellow. Each of these colourways are made from colourfast material to ensure the colour won't run in the wash. We also offer a range of size options so players of any age can wear them. Team the Atlanta Fitted Polo with some of the other items in our Atanta range. Soon enough, your whole team will be looking great.